The following review was conducted in August 2016. The following review was conducted in July 2016. We’re big fans of the most recent phones from Yealink. When we heard Yealink had a new conference phone, we were interested to see how the company would add innovation to a device that is notoriously resistant to redesign. The Yealink CP860 is the company's first foray into the conference phone market. The following review was conducted in June 2016. The Grandstream GVC3200 is a video conferencing system with support for popular video conferencing protocols and platforms right out of the box. The GVC3200 is a standalone device, but it must be coupled with a speakerphone for full video conferencing functionality. Any USB or bluetooth speakerphone can be used with the GVC3200. The GVC3200 comes with Grandstream's GAC2500, an Android-based conference phone, so you won't have to go searching for additional parts as soon as you take the device out of the box. But it's up to you if you want to use a different speakerphone or not. This review will focus entirely on the GVC3200, but if you're interested in the GAC2500, check out our review here. The following review was conducted in May 2016. The following review was conducted in April 2016. 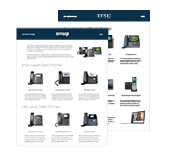 The Grandstream GXP2170 is an enterprise IP phone geared toward high-volume users. The GXP2170's most unique features are the 12 multipurpose keys that can function as any feature the phone offers. This feature list includes BLF, speed dial, and voicemail. There are 48 different features that can be programmed to these function keys in all. We'll talk about them more in the Features section. The following review was conducted in February 2016. The Yealink T48G is designed to handle demanding integrated communications needs. Yealink claims that the T48G was crafted with a "future-proofed infrastructure investment," jargon essentially meaning that the phone will not fall into obsolescence in the coming years. But the T48G surpasses standard desk phones in many ways, offering comprehensive features such as 16 VoIP accounts and TLS, SRTP, HTTPS, 802.1x, Open VPN and AES encryption. The following review was conducted in November 2015. The Panasonic KX-TGP600 is the newest iteration of the TGP series of DECT phones from Panasonic. As a cordless IP phone solution, the TGP600 offers increased mobility and versatility for wireless phones. And its ability to handle eight simultaneous calls is pretty mind boggling compared to the bare bones entry-level phones we've reviewed in prior months.